You are here: Home > So How Exactly Do iPhone, Android And Blackberry Users See Each Other? 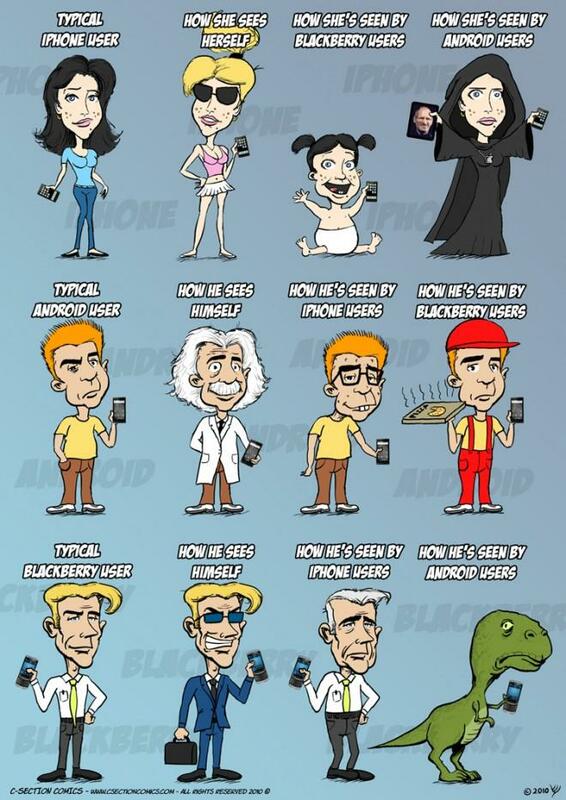 So How Exactly Do iPhone, Android And Blackberry Users See Each Other? To say that iPhone, Blackberry and Android users are an opinionated bunch would be the single most truthful statement I’ve ever made on this site. C-Section Comics agrees and has put together this handy little cartoon to help sort out the whole smartphone wars escapade. I could summarize it for you but it’s really just better if you look for yourself! That pretty much sums up how I view iphone and bb users. Ha lol thats just awesome….and pretty much right on target. Too funny. Hah! Brilliant! Even the punch line is good. This is seriously dead on on all accounts. Very much on point, Love it!! So true and seeing that dinosaur really was the icing on the cake. They are those specs of dust that got on your monitor at the bottom of the picture. Yeah, that kinda describes me. Well, maybe jeans and a collared shirt, anyway. But definitely ready to see how high my phone will bounce!! Can’t wait for my Android phone. I’m ready to look like Einstein, but will probably look like a cross between the ol’ fogey BB user and the pizza boy . LOLLLLLLL Favorite post of the day, made my day a better one instantly. Thanks! Holy crap this has to be the most accurate description of all there platform users. The dinosaur made me literally lol for like 2 minutes. I gotta show this to my coworkers cuz according to this they’re all dinosaurs lol. LMAO Funny. Its only tech. Some peopole (Fanboys) take it way too seriously. Posting to tumblr. TY. Best laugh I’ve had all day! Lmao that is dead on! Right on the money! But what about WM and symbian? The pizza man obviously means the navigation that android has of google maps…..
Pizza guy… i guess they are saying broke or budgeting?? Not in the business world is my guess. The part of a joke that you dont get is usually the part that most closely applies to you. That is absolutely hilarious! I especially like the way Android users see iPhone users. I absolutely blew the mind of a guy training me on a new computer software at work yesterday when I showed him voice search on Android, and how you could use Google Goggles to do OCR scanning, which you can then copy and paste into an email. Pizza Guy = advanced burger flipper, doesn’t have real business job :) ie: BB User doesn’t see Android as real business phone. This is hilarious and spot on. What a great chart! Android ISN”T a real business phone. But the pizza business….hmmmmm….that sounds pretty lucrative. nice. This was a good post. Real funny. Its a religious zealot. You know, for the apple fanatics. It’s not a reaper. It’s a member of a cult. I gotta go bang some Apple users. Some of the most zealous comments, even to the point of threats against life, have been by Android users. It’s a bit disgusting. For God’s sake, it’s a damned phone operating system, not a religion or a way of life. Get a grip. I don’t see such hate from any other group of mobile phone users. That’s awsome. The question is though, how do smartphone useres view featurephone users? That Dinosaur up there looks about right to me. For WP7 I see a nerdy pimply teenager with a small head and a leather jacket. That’s my android perspective. palm and windows…? huh makes you think…..naw no it doesnt, it makes sense! Where are Windows Mobile/windows phone 7, symbian & palm os? No zombie in the iphone section… HUGE FAIL.